Last February I shot a short test film with the Canon Cinema EOS C300. Thanks to Canon I got the loan of the camera for a few days and we shot a short narrative film titled THE ONE OFFS. My article about the production can be read here. 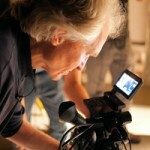 Shooting THE ONE OFFS on the C300 was a terrific experience and I loved the camera. 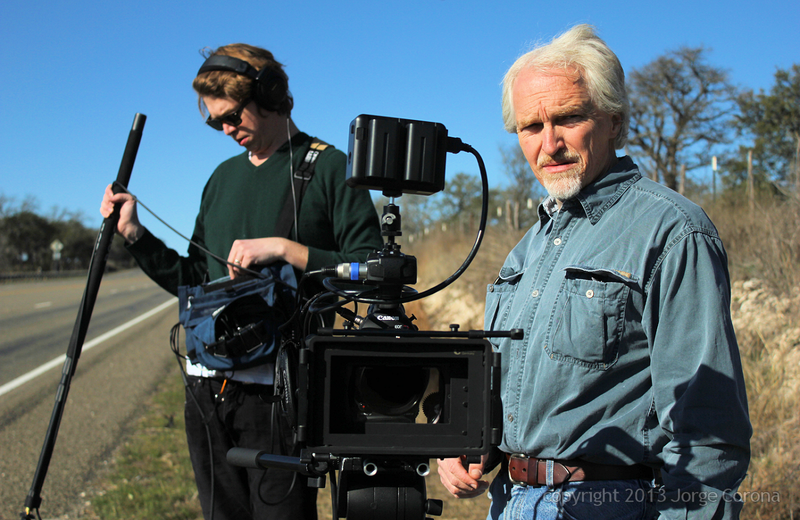 Since then I’ve shot client projects with the C300 on a rental basis, mainly through Austin cinematographer Craig Chartier. On every job the C300 delivered exactly what I wanted and I weighed the option of purchasing one for months. In the end I couldn’t justify the price of owning rather than renting for occasional shoots. 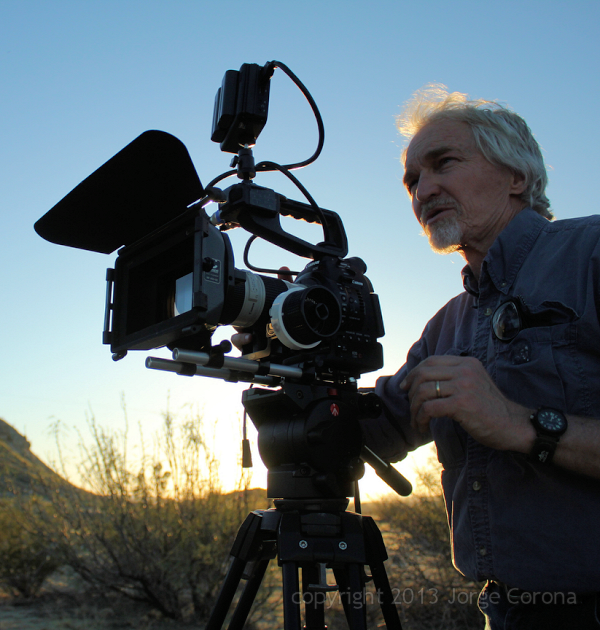 The Canon Cinema EOS C100 came along in November and I made the leap. The C100 has the same sensor as the C300 and C500 and delivers essentially the same 1080 signal for less than half the cost (differences in recording format and body design will be dealt with later in this piece). Terry Nixon at Texas Media Systems in Austin loaned me a C100 for a test shoot and I was sold. I opted for Canon’s lease program and fleshed out a camera package with a Canon EF 16-35mm f/2.8L lens and a Ninja 2 external digital recorder (I already own a Canon EF 85mm f/1.8). All that fell into place at the beginning of the year just in time to shoot a feature length comedy I’d been writing titled ARLO AND JULIE. It focuses on a couple whose obsession with a puzzle unravels their relationship in a comic fashion. The leads are Alex Drobrenko (he was in THE ONE OFFS) and Ashely Spillers. They’re great, very talented people. The supporting cast includes Mallory Culbert, Hugo Zesati, Chris Doubek, Sam Eidson and Annalee Jefferies. It is a uniformly great, small cast. We filmed 90% of the movie on location in Austin. Mostly at an apartment near UT and on a sound stage on the 6th. floor of the UT communications building. I teach film there, and the department allowed me to make this project as part of a class. I would up with two professionals: Kakii Keenan (art director) and Joe Bailey, Jr. (sound recordist) and fourteen students. The students filled in all the other roles and really stepped up to the challenge of ten, eleven and twelve hour days of work. We started shooting on Wednesday, January 30, 2013 and wrapped principal photography on Sunday, March 3. I’m editing the film now and will have a rough cut by May. We’ll have a final version by the end of the summer. Meanwhile, I thought I’d file a report on shooting with the C100 in the field, on a feature project and detail our camera package and logic for production. Canon Cinema EOS C100: I bought the basic kit and added an extra battery. For one week we shot with two cameras, the second provided by Ben Smith of Hattiesburg, Mississippi. Lenses: We used four on this shoot. They were a Canon EF 16-35mm f/2.8L, a Canon EF 85mm f/1.8, a Canon EF 50mm f/1.2L*, and a Canon EF 70-200 f/4L† (*Loaned by gaffer Chris Lowery, † loaned by camera assistant Jorge Corona). Digital recorder: Atomos Ninja 2. Camera set up: 1080, 24P, 180º shutter, in Canon Log mode. Recording: On-board: ACHDV, 24 bit on Delkin flash memory cards. External: Ninja 2, ProRes (HQ), 422. We set the camera up to optimize color correction in post by shooting in LogC, almost exclusively at 850 ISO. We occasionally bumped the ISO up when we needed the sensitivity. The chip in the Canon Cinema cameras is very sensitive and virtually noise-free all the way up to 6400 ISO and beyond, so we had no worries about noise. Canon recommends 850 for maximum latitude, so we tried to stick with it for that reason. We recorded to an on-board card and to the Ninja 2 simultaneously, using the on-board AVCHD file as a back-up. The Ninja is triggered by the camera, so it made recording externally very easy. The Ninja connects to the C100 via HDMI and passes through HDMI, so we hooked up the Marshall monitor (which has HDMI-in, only). We didn’t mount the Marshall on the camera, opting instead to use a 12-foot HDMI cable and hand hold the monitor for monitoring when the camera was on the jib or in an awkward position. We never wiped a memory card, SSD or SDHD. 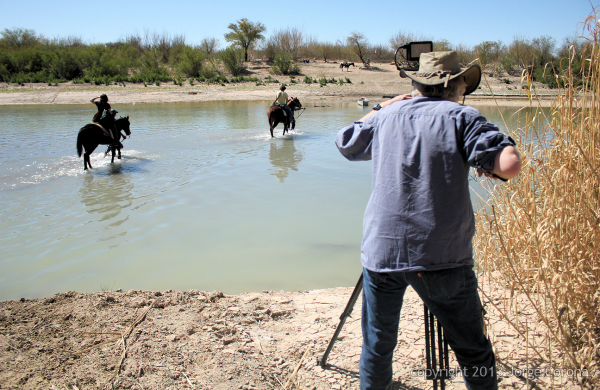 Our Delkin, class 10 cards ran about 20.00 each and held 80 minutes of footage. The SSD drives cost 160.00 each. In the end we bought 12 Delkin cards and 4 SSD drives, all of which are now archives for the movie. Additionally all the SSD files are backed up on a Western Digital 1 TB external drive. Finally, all the source files are now duplicated on an internal drive in my Mac Pro we’re using for editing. I don’t see a reason to wipe drives and re-use them. Our total cost for memory, for a feature film, was about $880.00. Coming from a motion picture film background, where one eleven-minute roll of 400 ft. Kodak film is $135.00 plus processing and transfer costs, makes memory for a feature project at under $1,000.00 seem to be both a bargain and a wise investment. That memory, after all, is the only representation of the work. 1. You have to ‘wake it up‘ by waving your hand in front of the lens. Somehow, and I don’t know why, it has to be triggered by motion to make it come to life after you power it up. We soon got used to this and it became a comic routine to find the right wave (frequency) and distance to get it to come to life. 2. SSD Issues. On a couple of occasions, triggering the Ninja produced many random frames prior to coming up to speed and recording normally. Playing back the files, we found often ‘ghost’ files prior to the actual full recording of a take. In the end we never lost a file, but it made playing back a take a little more awkward since we’d often try to play a file that wasn’t actually a full take. Marshall 5” Field Monitor: This thing is great and inexpensive. The image is bright and sharp. It’s lightweight (and made of molded plastic, so don’t drop it.) It was perfect for us. It only has HDMI and that’s all we needed. One issue, though: it runs on AA batteries, and it burns through them fairly fast. You’ll need three sets of 4 rechargeable batteries to make it through a day. The great thing is, in a pinch, you can be back in business after a trip to the Seven Eleven. Ergonomics: The C100 is a better body design, believe it or not, than the C300. One of the unique design features of the c300 is the LCD display that’s mounted above the camera body. It attaches via a hot-shoe and cleverly flips to many angles so that you can monitor the shot from many positions. However, I find that the display and the controls that go with it make for a slightly awkward, slightly top-heavy and, sometimes cumbersome. (I hate to complain about it, and I’m actually not complaining. It’s a great design, but presents a few challenges in the field.) Additionally, the XLR audio inputs are built-in to the monitor. If you choose not to use the monitor (which is possible thanks to the modular design of the camera) you also loose the XLR inputs. The C100, on the other hand, has a simple handle with built-in XLR audio inputs. It’s very sturdy and has a lower profile than the C100 rig. This turns out to be crucial on shoots, since the C100 easily fits, completely built for shooting, in a ‘carry-on’ sized camera bag. The C300 is just tall enough to require that you remove the monitor from the top of the camera to get it in a normal sized bag. LCD: Mounted on the back, bottom of the camera, it’s in a perfect place. Nice, bright, sharp. Coupled with the fact that you can blow up the center of the chip of focus thanks to a button adjacent to the trigger, it made focus issues a non-issue. Viewfinder: It’s adequate. People have complained about the C100’s viewfinder because it is small. It is small. Compared to the terrific viewfinder built into the C300 it is tiny. It also doesn’t articulate, which makes low angle usage kind of a pain. However, it is perfectly usable. I found that the diopter adjusted to my terrible eyesight, and that if I really got down into the viewfinder I could see everything quite well and even be confident of focus. The biggest issue is really light leakage around the eyepiece itself, and I often found myself shielding the sun or a light on the set from my eye. Also, we mostly shoot on a tripod, which made the viewfinder more usable than if we’d been shooting handheld. Using this viewfinder hand held is a challenge, since you have to hold the camera pretty tightly to your eye to properly see. On-board recording: The on-board files look terrific. We shot ProRes simultaneously, but I have to say it’s hard to see the differences between the two sets of files. I’d say that for corporate work you can use the on-board files and skip external recording and not worry about it. Battery life: Terrific. Two batteries will get you easily through a 12 hour day. Plus the batteries are small and lightweight. You don’t need large external batteries for this camera. Above: A shot from the feature film ARLO & JULIE featuring Ashely Spillers. Canon Cinema EOS C100. 1080p24 / Canon EF 16-35mm f/2.8L lens / ProRes(HQ). The C100 is quite a camera. The super 35mm chip is astonishing and the ability to cobble together 35mm lenses to suit your needs is a real pleasure. The camera is small and solid. You can build it up into a studio style rig or keep it small. If 1080p is your objective, the C100 is your camera. I’m pretty sold on 1080p as a solid, presentable standard short of full 2K or 4K. Last year I had a feature film that ran as a DCP (digital cinema package) in theaters all over the country. It was a 1080p file shot on a Sony EX1 and a Canon 5D Mk. II and Rebel T2i. It was up-rezed to 2K, and it looked astonishing on huge screens. So, I’d say, unless you’re well budgeted, you don’t have to fear poor exhibition up-rezing from 1080 to 2K. Beyond theatrical, you’ll be set for HDTV and Blu-Ray. In the end, I’m thrilled to have all the Canon Cinema cameras available for work. Between the Canon, Arriflex and Red cameras we’re all officially spoiled. It’s a great time to shoot!